This was my first introduction to a Bubble Map. The concept is that you have a word in the middle circle, and examples on the outside circles. "Pink" was our sight word for the week, and I wanted to teach them how we use the Bubble Map. 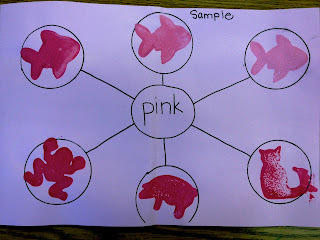 We wrote the word "pink" in the middle of the circle and then they stamped animals in the outer circles using different shades of pink paint.